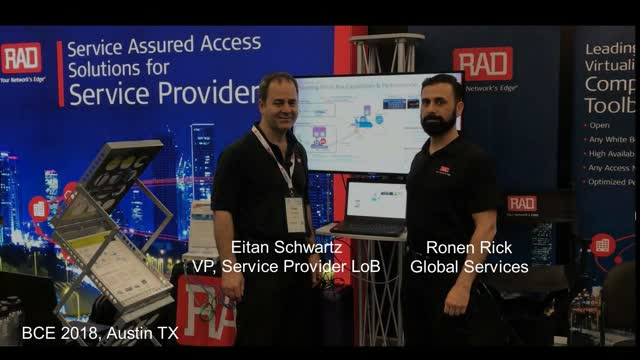 In this live demo, performed at the 2018 Big Communications Event, RAD’s Eitan Schwarz shows how the vCPE Toolbox helps boost white box performance, adding hardware acceleration and interface conversion functionalities. 5G is (or is going to be) fast – in fact, the speed-up as compared to 4G is going to be more dramatic than that of 4G over 3G. Supporting this speed requires a major overhaul of the Radio Access Network that transports information from the user to the core network. Most of the focus has been on the “air interface” from the user to the cellular base-station. In this webcast, we will focus on the xHaul segment from the base-station to the core. Edge Computing has been brought in as an approach to solve some of the main challenges of IIoT, but it is capable of much more than handling secure networking. In this webinar, we’ll share new developments in Edge computing and explain how it can be used to perform IIoT-specific, non-networking functions, such as OpenPLC and SCADA firewall. How to make an IIoT backhaul not only smart and interconnected, but also secure. View RAD’s security solutions for IIoT devices that combine always-on reliability and safe critical infrastructure communications. Learn about the advanced security features embedded within RAD’s SecFlow IIoT gateway. Network operators of critical infrastructure are facing tremendous challenges in migrating from TDM to packet-based WANs – Carrier Ethernet, IP/MPLS and MPLS-TP. View RAD’s software-based MPLS OT-WAN solution in action and learn how it can facilitate the transition to more advanced next-gen communications while maintaining high service and network reliability. When NFV and SDN were first introduced, they held the promise of a true revolution in network communication. However, inherent obstacles stopped operators from getting on the SDN/NFV Bandwagon. Find out how RAD’s vCPE Toolbox can help service providers surmount these obstacles and roll out carrier-grade, NFV/SDN-based business services today while realizing the vCPE’s full potential. SD-WAN solutions, despite their undeniable value, are turned out to be walled gardens. Learn how RAD's vCPE Toolbox prevents vendor lock-in allowing service providers full control and flexibility to pick and choose the best of breed VNF that fits the needs of their customers and deployment scenarios. See AT&T's Elie Francis presents the joint RAD-AT&T proof of concept at the MEF18 event. The PoC demonstrated how uCPE-based services are added with SDN/NFV/Legacy capabilities. Learn how to integrate new, dynamic VNF-based services with legacy infrastructures (CE2.0, PPP, MLPPP, voice, etc. ), and see how to manage network and VNF service-chain traffic analysis and diagnostics by SDN (ETSI NFVI – OMC platform). In this webinar, we explain how network operators ensure cost-effective two-way communications for highly distributed industrial IoT (IIoT) devices with always-on reliability and mission-critical protection. The latest insights on vCPE, NFV, SDN and edge virtualization, industrial IoT with edge computing, and the disaggregation of software and hardware.